Added by Bill Bowman on September 5, 2018. 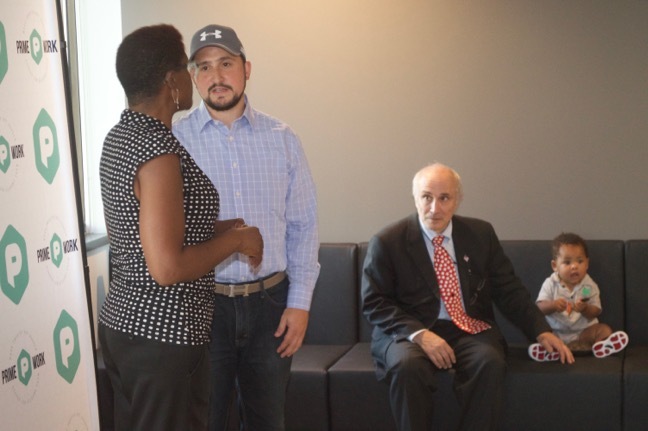 Avi Orlansky, center, PrimeWork CEO, speaks to Deputy Mayor Shanel Robinson while Mayor Phil Kramer looks on at the PrimeWork grand opening Sept. 4. Owners of small- and medium-sized businesses who don’t want to make a large investment in office space may have a new ally in the township. PrimeWork, a company offering shared-space office solutions, has opened its first location at 100 Franklin Square Boulevard, off Davidson Avenue. The 28,000-square-foot space encompasses the entire fourth floor of the building, and features a variety of shared space offerings, from group desks to individual offices. The Franklin office space has free WiFi, seven conference rooms, a “phone booth” for those who just need a secure place to make a telephone call, and spaces for events and workshops, Orlansky said. There are also mailing services and, if necessary, receptionist services, he said. “Based on what their needs are, we build a contract off of that and we try to do whatever we can do on our part so they” have only to worry about their business, he said. Prices for shared space range from $250 a month for a shared desk, $500-$700 for a private office and $2,500 to $3,000 a month for several combined offices. Orlansky said companies that have signed up so far tend to be in the information technology and marketing fields. Other sites are planned for Jersey City, Parsippany and Brooklyn, N.Y., he said. Mayor Phil Kramer, who attended the company’s Sept. 4 grand opening with Deputy Mayor Shanel Robinson, said that PrimeWork will be good for the township.